A). Produce in quantity sufficient food for the predicted 9.2 billion people which will inhabit this planet in 2050 by putting main emphasis of the “traditional” freshwater based terrestrial agricultural systems towards marine-culture. B). Produce in a qualitative way on a worldwide scale a “substitute”-diet which has great characteristics with the Paleolithic diet for which we gave in this evidence in this review that this hunter gatherer diet will prevent chronic inflammatory diseases (like the in this review described pandemic of IR/DM2 , in order to achieve a healthier world population in the 21ste century. C). The advantage of the IMTA food production-system is that (mainly Asian) countries, were the great explosion of IR/DM2 is expected in countries like China and India (were more than half of the world population will live in 2025 (Diabetes Atlas 2006)), are historically common with this way of food production systems like the combination of rice culture with fish and Integrated livestock-fish farming systems. The nowadays huge IMTA industry e.g. in China is developed and copied from these traditional extensive poly-culture Asian aquacultural systems. China is at this moment the world’s largest aquaculture products supplier with shellfish/seaweed IMTA developed in coastal embayments. The seaweed industry is in an advanced stage in Eastern-Asian countries were the estimated seaweed production numbers 80 percent of the total amount of seaweed products in the world in 2006 (FAO, 2009). This makes a further implementation and development of the IMTA food production system much easier with has hopefully the side effect that e.g. the explosion of IR/DM2 in these regions by the healthier IMTA produced food ingredients will decrease the epidemic of IR/DM2 among Asian population. D). Create by using IMTA as more sustainable food production system in terms of integrating human nutrition with ecology (Figure 5). Figure 5: Overview of the IMTA production system which contains healthy food ingredients which correspond with the Paleolithic diet and possibly can halt the burden of chronic degenerative diseases related to Obesity/Type-2 diabetes but also in conjunction with an elderly world population. 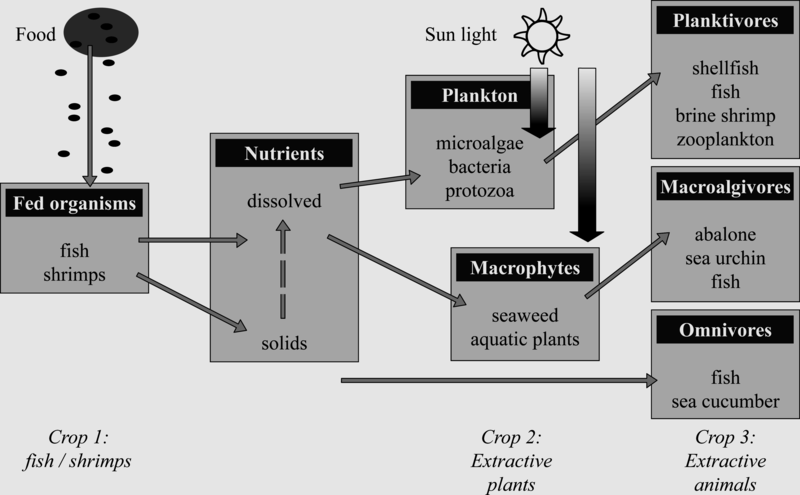 The efficiency of the photosynthetic process of a terrestrial crop or a seaweed from the oceans is a reflection of the growth which ultimately determines the amount of green biomass which can be harvested. Seaweeds and other marine plants are the primary producers in the marine environment. They form the standing crop and determine the productivity of all communities. Seaweed-based ecosystems are amongst the most productive on Earth.